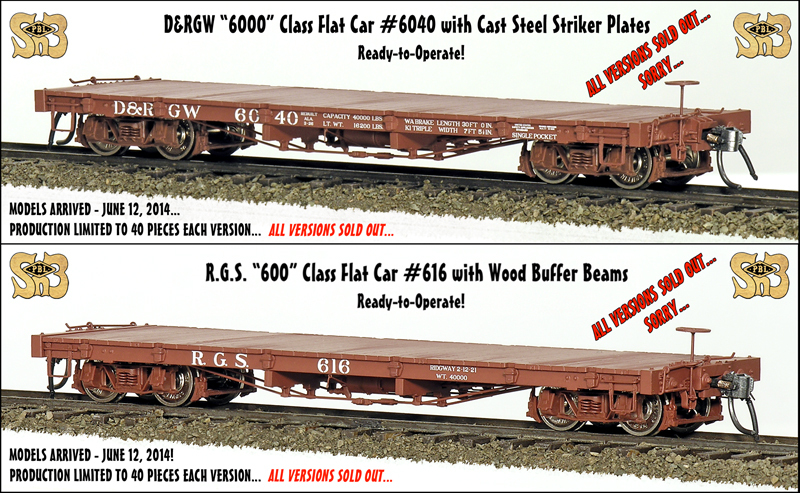 The Ready-to-Operate "6000" class Flat Cars of the D&RGW, and the "600" Class Flat Cars of the R.G.S. are now sold out! Carefully researched from the actual prototypes and modeled bolt for bolt, these cars were graced with die cast underframes for optimal weight distribution and good tracking,... Added to this were our highly detailed free-rolling trucks with their coined "Griffin-Denver" wheelsets and Genuine Kadee Couplers, these models had it all! Two distinct styles were produced: The Wood Buffer Plate style of the pre-1926 "rebuilding", and the Cast Steel Striker Plate type of those having been rebuilt in the twenties, 18 cars in all having been produced... This page features stellar photographs, at least four per car number for your enjoyment... Ya just gotta see 'em to believe 'em! All in "Sn3", of course... "Sn3" = 3/16" = 1'-0" Scale - From P-B-L, Naturally! As used by both the D&RGW and the R.G.S.! PLACE YOUR MOUSE OVER THE PHOTO BELOW FOR A MAGNIFIER TO SEE IT BETTER ! Plus Detail Photos of each too! PLUS THESE R.G.S. "600" CLASS FLATS TOO! THESE MODELS WERE CREATED FROM BRAND NEW TOOLING! And believe me, they roll as good as they look! Eighteen different road numbers... 12 lettered for the D&RGW; 6 lettered for the R.G.S.! With THREE different shades of paint ! ALL versions are suitable for 1920's era onward; Yet most are suitable for 1940's-up era modeling too! 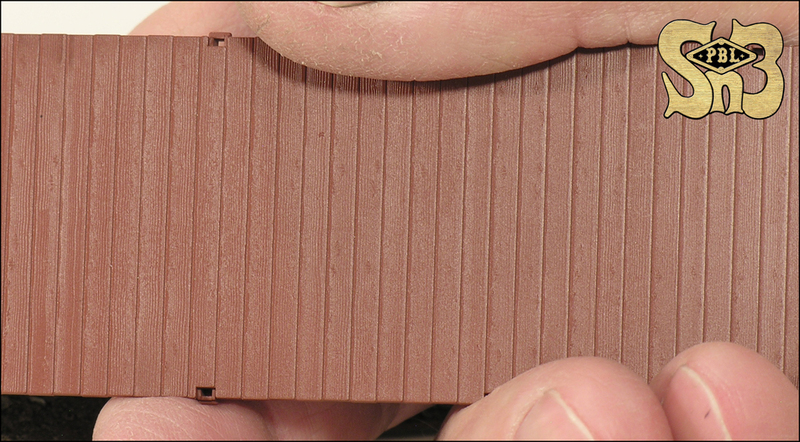 Unbelievable detail from Brand New Tooling created from in house SOLID MODEL drawings! Including Die Cast Underframes! 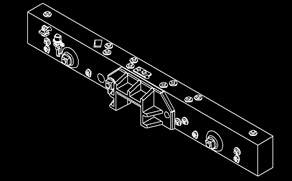 Perfect, trouble free operation is tough to achieve with an unloaded flat car, but unless you're towing a sash weight for a caboose, these models will offer trouble free operation right on your home layout! 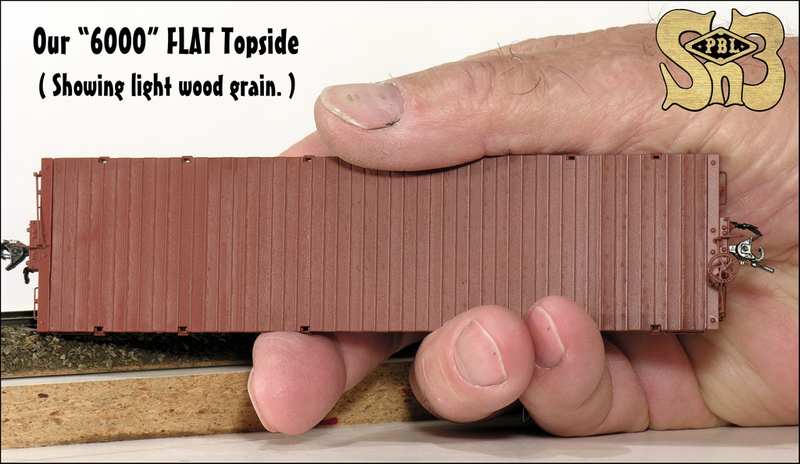 Two distinct styles of easily identifiable end sills! Just like the prototype! 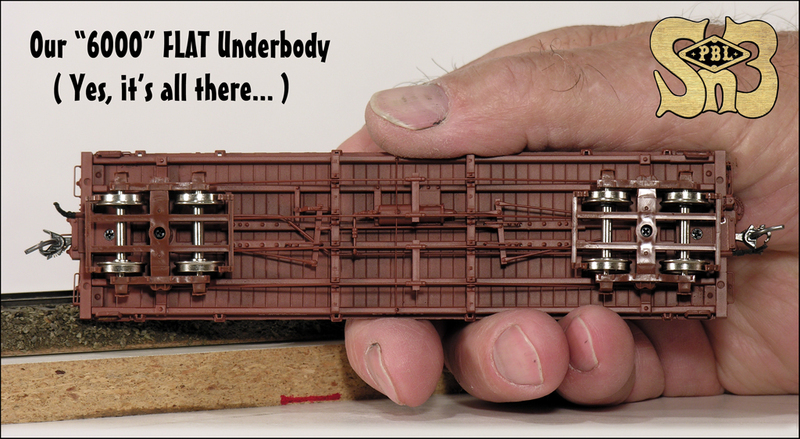 Fully detailed underbodies with accurately scaled parts! 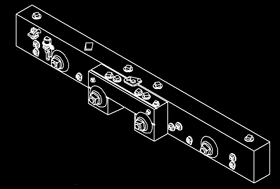 Our super-smooth rolling 3'-7" Arch Bar Trucks! Our highly detailed coined metal wheelsets! Our Real Rubber Air Hoses! Flawless decorating from all new in-house created artwork! Most cars modeled from an existing prototype or prototype photo! THESE CARS ARE FULLY ASSEMBLED and READY-TO-OPERATE! End sill comparisons below... Note that not even their top sides are the same! Most now sold out... Next model run? Unknown... Order yours today ! Note: These are complicated, highly detailed scale models that have been hand assembled by professional model builders, not machines. Besides paint shades, (intentional) some (unintentional) slight variations may exist between like cars. Dial 707-462-7680 to talk to a REAL PERSON and Order Yours Today!